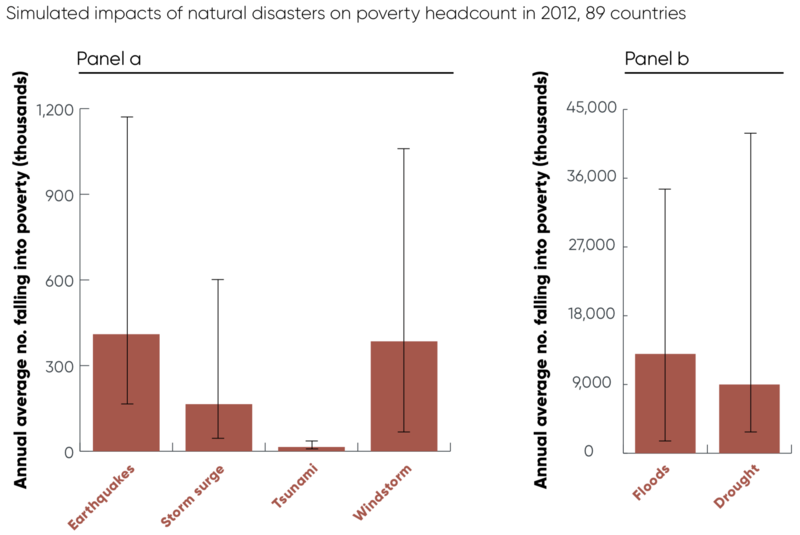 From “Unbreakable”: Estimated people driven into poverty annually by natural disasters. I think it’s an amazing bit of modeling to be able to relate natural events to the excruciatingly chaotic process we call “falling into poverty”. But it’s the scale of the two sides of the graph that blows me away. On the left, earthquakes, storm surge, tsunamis, and windstorms all together account for about 1 million people falling into poverty every year. On the right, floods account for 10x as many, and droughts account for an additional 8x as many. The reason is that floods and droughts are naturally huge events– covering large areas and affecting millions of people– every time they occur. The second is that they occur all the time. This gets at the importance of water. Most of the researchers I know don’t spend much time thinking about water. They know it’s important, but in a way that’s so commonplace as to be invisible. We just said that 18 million people fall into poverty each year from floods and droughts; in 2015 there were 736 million people in poverty total. That means that if we magically got everyone out of poverty today, in 41 years, there would have already been 736 million new instances of poverty from floods and drought alone. Water is about enough to explain the stubbornness of extreme poverty all on its own. I like to think I make art, sometimes, but all of my work exists only in this virtual Neverland. My works can be seen, but only through a glorified microfiche scanner, and if you choose to look to the right tiny speck. I wish I had a studio like Elstir’s where people could wander, with real hands tilting back real physical picture frames. There’s a magic in printing things out, like a spell that reincarnates from the spirit-like 1s and 0s. Flame and I have over a dozen hand-picked photo albums from our various trips, ready should anyone care to open some memories. I want similar momentos for my projects. I thought for a while of building a converter that could represent the structures of code and data as intricate art. But no converter would see the beauty that I see in my own work. So, I’m thinking of just printing and binding my papers (completed, whether published or not). I’m not above making them into mugs instead, or making blown-up figures etched in canvas. But the first step is to leave them leaning one on the other, and see if anyone takes a peak. I have fish! Two lovely creatures, my current obsession. I have not had an aquarium since I was 14 (when, at my height, I had tanks’ worth), but my new tank is at the center of our London flat. Paige is a Pearl Gourami. You can see her center stage, above. She’s a bit of an attention hog, but she’s beautiful and knows it. I got her for a paper on a model I helped build, named Mimi-PAGE, so it’s no surprise that she’s a model. Robbie is a Red-tailed Black Shark (not an actual shark sadly). He’s quite shy, and you can just see his tail behind Paige. He inches along the gravel, propelled by his flaming tail, and I got him for a paper on transportation in Nairobi. As I get more fish, I fully expected to be in a constant publication race against their perishing, but I didn’t do my research. Given the opportunity, Paige is going to grow 5 inches long and 5 years old, and Robbie is going to get 6 inches long after 9 years. And by the time Robbie comes of age, his instinct for territory is likely to be the terror of any other paper I try to publish. Flame got me a 23andme genetic testing kit (report? procedure?) for Christmas! I’m excited to get some cliffnotes to my user manual, but I was surprised at how daunted I would feel. Preparing my saliva sample felt fatalistic, like each spit was nailing closed the possible; though, I suppose it was just a knock on the door to the actual. I’m afraid of what I’m going to see. I got the genetic health option, and one of the items on the list is Parkinson’s, with which I watched my grandfather slowly die. That alone tells me that I have a chance that I’m predisposed– do I want to know that it’s definitely waiting in my future? I want to want to know. On a happier note, I get to find out my paternal haplogroup. From an uncle’s genetic test, I know that my mother’s side comes from the lost land of Doggerland. And I think that my Y-chromosome comes from the east coast of England, but the story is so murky against 300 years of being American that I’m really curious what I’ll find. Part II when I learn more! I wrote this up over the holidays, to feed into some discussions about the failings of integrated assessment models (IAMs). IAMs have long been the point at which climate science (in a simplistic form), economics (in a fanciful form), and policy (beyond what they deserve) meet. I’m a big believer in the potential of models to bring those three together, and the hard work of improving them will be a big part of my career (see also my EAERE newsletter piece). The point of this document is to highlight some progress that’s being made, and the next steps that are needed. Thanks to D. Anthoff and F. Moore for many of the citations. Integrated assessment models fail to accurately represent the full risks of climate change. This document outlines the challenges (section 1), recent research and progress (section 2), and priorities to develop the next generation of IAMs. The problems with IAMs have been extensively discussed elsewhere (Stern 2013, Pindyck 2017). The purpose here is to highlight those challenges that are responsive to changes in near-term research priorities. I think there are three categories: scientific deficiencies, tipping points and feedbacks, and disciplinary mismatches. The calibrations of the IAMs are often decades out of date (Rising 2018) and represent empirical methods which are no longer credible (e.g. Huber et al. 2017). The IAMs also miss the potential and consequences of catastrophic feedback in both the climate and social systems, and the corresponding long-tails of risk. Difficulties in communication between natural scientists, economists, and modelers have stalled the scientific process (see previous document, Juan-Carlos et al. WP). Progress is being made on each of these three fronts. A new set of scientific standards represents the environmental economic consensus (Hsiang et al. 2017). The gap between empirical economics and IAMs has been bridged by, e.g., the works of the Climate Impact Lab, through empirically-estimated damage functions, with work on impacts on mortality, energy demand, agricultural production, labour productivity, and inter-group conflict (CIL 2018). Empirical estimates of the costs and potential of adaptation have also been developed (Carleton et al. 2018). Updated results have been integrated into IAMs for economic growth (Moore & Diaz 2015), agricultural productivity (Moore et al. 2017), and mortality (Vasquez WP), resulting in large SCC changes. The natural science work on tipping points suggest some stylized results: multiple tipping points are already at risk of being triggered, and tipping points are interdependent, but known feedbacks are weak and may take centuries to unfold (O’Neill et al. 2017, Steffen et al. 2018, Kopp et al. 2016). Within IAMs, treatment of tipping points has been at the DICE-theory interface (Lemoine and Traeger 2016, Cai et al. 2016), and feedbacks through higher climate sensitivities (Ceronsky et al. 2005, Nordhaus 2018). Separately, there are feedbacks and tipping points in the economic systems, but only some of these have been studied: capital formation feedbacks (Houser et al. 2015), growth rate effects (Burke et al. 2015), and conflict feedbacks (Rising WP). Interdisciplinary groups remain rare. The US National Academy of Sciences has produced suggestions on needed improvements, as part of the Social Cost of Carbon estimation process (NAS 2016). Resources For the Future is engaged in a multi-pronged project to implement these changes. This work is partly built upon the recent open-sourcing of RICE, PAGE, and FUND under a common modeling framework (Moore et al. 2018). The Climate Impact Lab is pioneering better connections between climate science and empirical economics. The ISIMIP process has improved standards for models, mainly in process models at the social-environment interface. Since the development of the original IAMs, a wide variety of sector-specific impact, adaptation, and mitigation models have been developed (see ISIMIP), alternative IAMs (WITCH, REMIND, MERGE, GCAM, GIAM, ICAM), as well as integrated earth system models (MIT IGSM, IMAGE). The latter often include no mitigation, but mitigation is an area that I am not highlighting in this document, because of the longer research agenda needed. The IAM Consortium and Snowmass conferences are important points of contact across these models. Of the three challenges, I think that significant progress in improving the science within IAMs is occurring and the path forward is clear. The need to incorporate tipping points into IAMs is being undermined by (1) a lack of clear science, (2) difficulties in bridging the climate-economic-model cultures, and (3) methods of understanding long-term long-tail risks. Of these, (1) is being actively worked on the climate side, but clarity is not expected soon; economic tipping points need much more work. A process for (2) will require the repeated, collaboration-focused covening of researchers engaged in all aspects of the problem (see Bob Ward’s proposal). Concerning (3), the focus on cost-benefit analysis may poorly represent the relevant ethical choices, even under an accurate representation of tipping points, due to their long time horizon (under Ramsey discounting), and low probabilities. Alternatives are available (e.g., Watkiss & Downing 2008), but common norms are needed. Burke, M., Hsiang, S. M., & Miguel, E. (2015). Global non-linear effect of temperature on economic production. Nature, 527(7577), 235. Cai, Y., Lenton, T. M., & Lontzek, T. S. (2016). Risk of multiple interacting tipping points should encourage rapid CO 2 emission reduction. Nature Climate Change, 6(5), 520. Ceronsky, M., Anthoff, D., Hepburn, C., & Tol, R. S. (2005). Checking the price tag on catastrophe: the social cost of carbon under non-linear climate response. Climatic Change. CIL (2018). Climate Impact Lab website: Our approach. Accessible at http://bit.ly/2SKT8XB. Houser, T., Hsiang, S., Kopp, R., & Larsen, K. (2015). Economic risks of climate change: an American prospectus. Columbia University Press. Huber, V., Ibarreta, D., & Frieler, K. (2017). Cold-and heat-related mortality: a cautionary note on current damage functions with net benefits from climate change. Climatic change, 142(3-4), 407-418. Kopp, R. E., Shwom, R. L., Wagner, G., & Yuan, J. (2016). Tipping elements and climate–economic shocks: Pathways toward integrated assessment. Earth’s Future, 4(8), 346-372. Lemoine, D., & Traeger, C. P. (2016). Economics of tipping the climate dominoes. Nature Climate Change, 6(5), 514. Moore, F. C., & Diaz, D. B. (2015). Temperature impacts on economic growth warrant stringent mitigation policy. Nature Climate Change, 5(2), 127. Moore, F. C., Baldos, U., Hertel, T., & Diaz, D. (2017). New science of climate change impacts on agriculture implies higher social cost of carbon. Nature Communications, 8(1), 1607. Nordhaus, W. D. (2018). Global Melting? The Economics of Disintegration of the Greenland Ice Sheet (No. w24640). National Bureau of Economic Research. O’Neill, B. C., Oppenheimer, M., Warren, R., Hallegatte, S., Kopp, R. E., Pörtner, H. O., … & Mach, K. J. (2017). IPCC reasons for concern regarding climate change risks. Nature Climate Change, 7(1), 28. Pindyck, R. S. (2017). The use and misuse of models for climate policy. Review of Environmental Economics and Policy, 11(1), 100-114. Steffen, W., Rockström, J., Richardson, K., Lenton, T. M., Folke, C., Liverman, D., … & Donges, J. F. (2018). Trajectories of the Earth System in the Anthropocene. Proceedings of the National Academy of Sciences, 115(33), 8252-8259. Stern, N. (2013). The structure of economic modeling of the potential impacts of climate change: grafting gross underestimation of risk onto already narrow science models. Journal of Economic Literature, 51(3), 838-59. Vasquez, V. (WP). Uncertainty in Climate Impact Modelling: An Empirical Exploration of the Mortality Damage Function and Value of Statistical Life in FUND. Masters Dissertation. Watkiss, P., & Downing, T. (2008). The social cost of carbon: Valuation estimates and their use in UK policy. Integrated Assessment, 8(1). 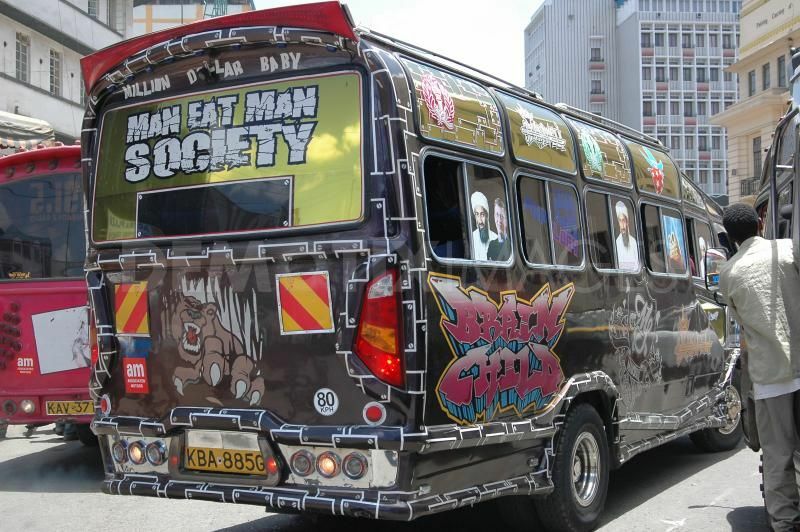 The matatu system is extensive, essential, efficient, and completely unplanned. In Nairobi’s hurry to accommodate the transport needs of a population that grows by 150,000 people a year, it has ignored this piece of infrastructure. Sometimes it has even undermined it. The goal of this paper is to measure how important matatus are, in the context of the whole range of transportation options and income groups. What does this paper bring to the table? This is one of very few analyses on informal transportation networks anywhere, building upon the incredible work of the Digital Matatus Project, co-led by our co-author, Dr. Klopp. It’s also fairly unique in looking at transport accessibility in the developing world at all (most work on accessibility is done in rich countries). Not surprisingly, transport needs in developing countries are different. Matatu access drops more quickly then driving or walking accessibility as you move away from Nairobi’s center. That’s an indication of the structure of the matatu network, helping people in Nairobi center the most. Controlling for distance from the center, richer communities have low accessibility. Many people from those communities have cars, but it matters because their workers do not. In fact this communities tend to be quite isolated. Tenement housing has quite strong accessibility, because matatu networks tend to organize around it. What tools do we have for research in this area? We developed quite an extensive body of tools for studying (1) accessibility in general, and (2) transit networks in particular. If you find yourself in the possession of a cool new transit network database, in “GTFS” format, we have code that can analyze it. Prompt me, and I can work with you to open-source it. People often assume that since I have background in computers, I must be an enthusiast of blockchain technology. I have never seen much use for it, since anything that blockchains can do, a traditional database can do more efficiently. But I understand that blockchains have an application, a situation in which they are the right tool for the job: if you cannot build a trustworthy institution and want to keep shared records, blockchains will let you. By institutions, I mean organizations like banks or government, which could keep these records, along with a common understanding of the rules they use. If I, as an individual, want to make a system for distributed, anonymous users to keep records, it is easy to make an interface to a database that provides that. I would define the rules, and my software would follow them. But then you have to trust me to not use my power over the rules to my advantage. Or, in the case of societal institutions, we have to believe in systems of oversight to ensure good behavior and procedures for responding to bad behavior. If you cannot trust a central authority, traditional databases will not work. The cost to pay for this lack of trust is energy use. The blockchain mining system turns computing power into security, with bitcoin alone consuming more electricity annually than Austria (73 TWh/yr vs. 70 TWh/yr). Blockchain technology is built on plentiful, cheap energy. I think the excitement about blockchain technology offers some insight into the world today, and the world that we are working to create. The world that blockchains are made for is a world of abundance, but abundance squandered by the lack of trusted institutions. And that is not all. It is a world not overly concerned with inequality. If there was extreme inequality of mining power, or collusion at the top, blockchain ledgers could be forged. Instead, the fear is against petty theft. We worry about minor actors breaking the law, and no institutions to recognize it and undo the damage. It is a world where anonymity is supreme. Letting institutions know our identity a necessary condition for allowing them to provide oversight. In a world of corrupt institutions, your identity might be used against you. It is a world in which you pay to maintain your own security. As mining rewards dwindle, it will be those who have the most to lose who will maintain the system. But in this, it must also be a world of continual competition, because if a single user or cartel effectively paid for the whole system, it would also control the ledgers. So, when people express such excitement about this or that application of blockchains, I mourn the loss of cooperation and common ground. Only a world of abundance could support blockchains, but only a fragmented world would need them. A short story I had in my head. I might have posted this a month ago, but foolishly relied on DreamWidth’s caching system to keep my draft of it. Enjoy! Captain Tony gazed for a moment at the view-screen. The woman talking looked to be in her late 30s, attractive but sensibly dressed in a fashion popular back home when he was last there. She stood in front of a narrow desk. The room had a large window, looking out over a mountain-scape, apparently covered with native vegetation. The communications engineer had described how quickly their translation system and the planet’s computers had converged. In the process, the aliens had expressed a seemingly insatiable interest for the materials in their library to use as translation aids: literature, history, videos, and information to familiarize themselves with the members of the crew. He looked over at the screen that transmitted a view from their external camera, and at the dark, shimmering planet they had entered a wide orbit around. “Where are you transmitting from? Our survey did not detect nearly as much greenery as you have there,” he motioned to the mountains. The next weeks were busy analyzing sensor readings of the obsidian-black surface of the planet. The government on the planet had provided more assistants for many of Tony’s officers and workers. Some of those had little use for them, while others appeared to forge close associations. Fifteen days after contact, Officer Margaret, head science officer, asked for a few minutes of his time. “There’s quite a lot of information we can use there, but analyzing it will take a long time. The aliens have had advanced science for a thousand years, but if they kept consistent star records through any portion that time, the assistants don’t seem to know where to find them.” Tony did some rough mental calculations. A thousand years would be enough to understand local dark matter movements with some creative analysis, but only with careful enough observations. Captain Tony felt a wave of exhaustion pass over him, as the third worker entered his office, two weeks later. He had woken to a full schedule of sequential 15 minutes meetings. The man who entered, Engineer Moon, had an air of impatience he had noticed recently in the crew. Tony raised his eyebrows. “Expand it? I was not aware that Officer Merle had granted accounts to the Engineering Workers at all.” In fact, he was sure that Merle had not. Like most made to his profession, Merle had a plodding, conservative demeanor which was a natural fit for his role. Tony put the rest of his meetings on hold, and make a request for Gaea. She answered immediately. “As prisoners?” Tony asked, his voice cold. Tony thought about it. There were certainly plenty on his crew that would jump that the opportunity to stay on a planet. Many faced the terminal phase of their mission with a kind of dread; they had fond memories of their years of training before the mission, and recognized the interminability of surveying the rocks on ringed planet. “You would be underneath our PV layer. We feel confident that we can build a satisfying living space for you. Let me show you some options.” Gaea turned toward her desk, and began arranging some papers from a drawer across it. Tony nodded, taking in the information. “How did they die?” He said with more guard than sympathy. I recently had the pleasure of speaking last week to the Science and Policy Summer School, in Paris. This is an interdisciplinary event that I helped to start back in 2011, under the tutelage of Laurence Tubiana, bringing together students from Columbia’s Sustainable Development program, Sciences Po’s IDDRI, and various Masters’ programs, to have some big discussions on bridging the gap between science and policy. The topic for this year was “Methods in Sustainable Development”. For my part, I gave a 10,000 ft. view of Complexity Science, and some of the methods available from it. Here is my complexity science methods presentation, in Prezi form. At the Sustainable Development Research (SusDeveR) conference this weekend, I offered some simple tools for performing Bayesian Regressions: Jump to the Github Repository. The point of these templates is to make it possible for anyone who is familiar with OLS to run a Bayesian regression. The templates have a chunk at the top to change for your application, and a chunk at the bottom that uses Gelman et al.’s Stan to estimate the posterior parameter distributions. The last line does all of the work, and just says (in OLS speak) that the error distribution follows a normal distribution. Most of the templates also have a more efficient version, which does the same thing. I say in the README what Bayesian regressions are and what they do. But why use them? The simple answer is that we shouldn’t expect the uncertainty on our parameters to be well-behaved. It’s nice if it is, and then OLS and Bayesian regressions will give the same answer. But if the true uncertainty on your parameter of interest is skewed or long-tailed or bimodal, the OLS assumption can do some real harm. 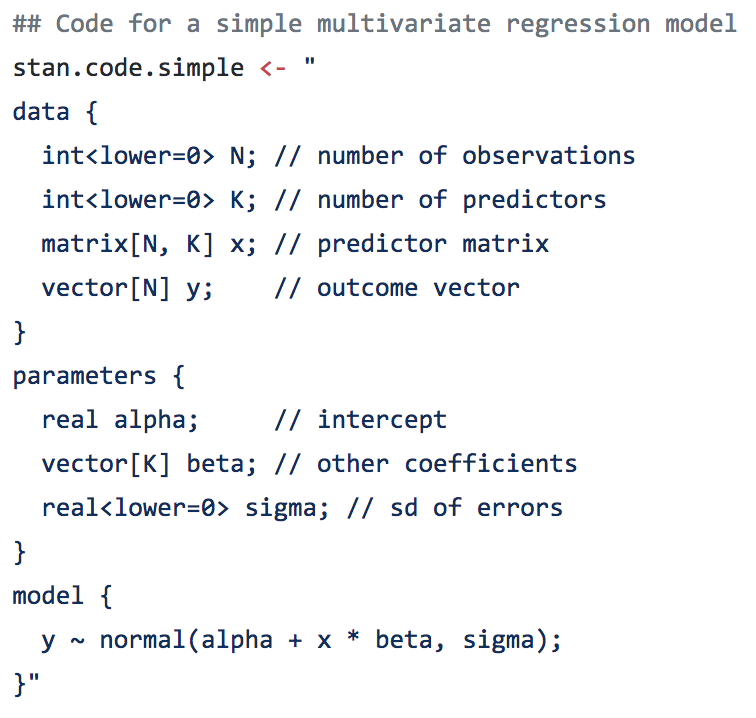 Plus, since Bayesian regressions are just a generalization of MLE, you can setup any functional form you like, laying out multiple, nonlinear expressions, estimating intermediate variables, and imposing additional probabilistic constraints, all in one model. Of course, the templates don’t show you how to do all that, but it’s a start. James Rising is a researcher of Sustainable Development. He studies and develops frameworks to model the feedback loops between environmental and human systems. He hopes to use new technologies to help communities act on those insights to mitigate climate change and promote social justice. James previously taught assorted seminars at MIT's Experimental Study Group and electrical engineering at Franklin W. Olin College of Engineering. He worked for six years as a software developer, working with over a dozen companies on signal processing, social networks, and artificial intelligence projects. James recently graduated from a Ph.D. in Sustainable Development at Columbia University.